Steemians: 11 Tips that Got me $100 an Article as a MinnowsteemCreated with Sketch. Success! It's what we all crave. After my exciting 100 Post a Month challenge to myself it only took 8 days of posting to achieve an incredible goal of $100+ on a Single Post. 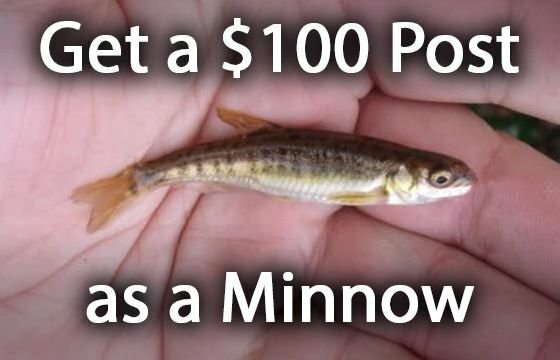 I'm super excited to give my experience and advice on how you can do this on your very own minnow account, to the best of my teaching ability! Leave a thoughtful comment on a similar post that you actually read, and relate it to your post. I guarantee if you put a little effort people will like our contribution and not consider it spam. You can also earn rewards for commenting, in case you didn't know. Maybe it was an autovote-bot (programming to vote up long articles) or a nice whale who read it, but my first $100 post was one of my longest; at 1,300 words. Despite the short attention spans these days, it's very much appreciated to be thorough. Better to have more than you need than less than is adequate. I can't tell you how you got here, but many new users must be bitcoiners coming in. Transfer some of that bitcoin into SBD (Steem Dollars) and find one of the people that Promotes Steemit Posts for just a few dollars. It will definitely help jumpstart you if you have the funds to do it! There's also excellent ways to promote for free on other platforms like Reddit and on Steemit Chat. 4. Make sure to Introduce yourself! New users on steemit should do everything they can to build their brand; and one great way is also well respected: Use the introduceyourself tag and tell a simple story of why you're on here, and if you like, your personal background or life story. Tell as much or as little as you want, but I'd recommend giving some substance people can chew on and appreciate. That little number by your username that everyone has, yeah that usually corresponds to the level of influence a user has on this site. I can remember just days ago when mine was 47 and now I'm at a cool 51 and still growing steady. Keep this in mind when you're deciding who to interact with and the behavior of users on here; this will show you how to make it big if you follow the model of those that have already achieved success! No one wants the same old tired information. Checkout this post, First Ever Recorded Live Child Birth On Steemit in 16 hours it's rewards are $175 with a post of a video and mostly images; they are being rewarded for being original, fascinating and entertaining. The post I mentioned about that made nearly $200, that user right now only has 257 followers who sometimes only made $2 per post, but also sometimes $10, $20 or $30. Rewards are not consistent. We can't predict what will be a success, but if you keep persevering and producing, you're just the more likely to be rewarded. Not only does your post need to be original, make sure to exemplify this fact in your headline. Frame things in a way that engage or trigger the mind to react like "wow, I have to read about that". Each time you pick a cool story also give as much thought to a good unique headline. I spent a lot of effor ton this article so it was disappointing to say the least. I think my title was too generic, as any random health site could discuss the same issue. It's also an unappealing topic. I later changed the title to "10 Less Mentioned Signs of Dehydration" because it is at least more descriptive that my list is not common items. I got an excellent comment that I can no longer seem to find...basically recommended for this kind of unappealing topic to be correlated to a recent event, such as a marathon, or major news story about dehydration. Think about this tip when you're passionate to write about something that may still seem a little boring. Since our steemit audience here is a lot of conscious Americans, I guess everyone is already familiar with this problem. Also because it was posted at 2AM could have dinged me. Oh, what was I thinking. I was greedy making this short ridiculous post. I tried to jump on the bandwagon of a price anomaly that sounds bullish on Steem but really just a waste of people's time. Sorry for this one guys. 2 Bucks is 2 Bucks, but really...this was only my 3rd post and I was super excited to get some rewards for it. Having no influence whatsoever way back then I was elated. I was speaking to an audience very receptive to cryptocurrency and giving my own personal experience that my slight expertise warranted. This was my first major success. After I wrote this I reached out to my friend @bullishmoney who generously cross-promoted it for me. Sometimes that's all you have to do is reach out to the right person you feel would love your article. In general this was an exciting post for steemians to enjoy, @bullishmoney probably had the better headline with "Steemit Is Already More Popular Than You Realize!". He earned $48.69; a Win-Win all around! BOOM. With this post I felt like I made it to the big leagues and my effort was finally paying off. I'm sure this post went organically viral because of the popular philosophy we all have here to buck the major corrupt system. Once again use the whales and dolphins as an example. The Great content creators usually have their own custom images, often with text overlay of the headline. To find copyright free images (to play it safe) select "Labelled for reuse" under google images 'usage rights' under their "Tools" dropdown. I've often failed on this one. I work late, and often enough post in the middle of the night. Research I've seen and my own results show that you do get a bit of a leg up by posting during peak hours, possibly 3PM to 6PM Pacific Time in the US. Comfortable reading means spacing out paragraphs, categorizing by using headers like I have in this post, as well as throwing images in there (something I'm neglecting here because this post is about teaching rather than entertaining). There we are. I originally had only 10 tips but that's pretty cliche these days and tip #11 is definitely important I think. This has been Mike Parker and I'm a Steemian! wow how'd you make $17 on this comment?! No kidding. I'm so confused by this place but I will persevere! This post received a 4.8% upvote from @randowhale thanks to @steemian69! For more information, click here! I love reading articles like this , lets me know the community is doing great. This post received a 3.0% upvote from @randowhale thanks to @mikeparker! For more information, click here! Thank you for the observations; it is difficult to stand out out on this platform. Just like building any small business; the beginning is rough; until you establish yourself. Build your brand by providing value for the community. In some sense it is largely entertainment value, often times just improving people's moods and sharing stories. That's a nice topic and good stuff to think about. I'm new myself and still trying to find the right way to bring my stuff and make it stand out. I make vlogs about my work as an indoor skydive instructor. Well sounds exciting enough; are you in california? "Family has a Ball in Zero Gravity"
I will take it in account. It's true, I'm still a bit clumsy with it but I'm very motivated to put in the work and follow the learning curve. I like your stuff a good range of interesting content. Keep up the good work. Yea man love philosophy. I enjoy all those topics. Your rep is higher than me! Make it happen! Thanks for the tips. I'm working on my second ever post for Steemit now and will implement what I've learned here. I'm using my own graphics and trying to make my post relevant and thought-provoking. Is it true there's bitcoin or blockchain classes taught at MIT? Thanks, made it from scratch on Paint haha. There's blockchain classes which are more about cryptography. But there's also an MIT Bitcoin Club and a Digital Currency Initiative which have been great resources for interested students like myself. Good point on the crowded page, I don't like that resteems look nearly identical to the author's posts. I've only made one post so far though so as I make more, I plan on being more selective on my resteems. Actually, I just published my second post. Since it looks like you decided to go with a real name, I was wondering if you'd be willing to contribute your thoughts as to why you chose your name. I want to be in for the long-term so i made the decision to build the brand around me. but I have other projects I could have picked a brand and may have other steemit accounts for those projects in the future. I was worried of being diluted; spreading myself over different brands or risk a brand failing and then worrying about the name being not applicable anymore. That makes sense. It becomes easier to start secondary accounts once you have one built up because you can direct your followers over there. Haha, the brand dilution and the name not being applicable are two things I talk about directly because I went through the same thing. it's true that it sometimes feels hard when your posts don't get the right attention. I keep it in the back of my mind that when I get bigger I will revisit the same topics I posted in the beginning if I feel they're important to share with a wider audience and/or deserve more attention. The chicken and the egg problem. What comes first? Quality posts or Large Following? We have to give pretty good quality to build the following even though we may regret the effort as we don't see immediate rewards. It's investing in the future of building the brand. Hahaha. I too think about reposting. Already done it twice xD. But they did worse the second time :( maybe because i mentioned that it was a repost. Thanks will do. Good interesting advice. Thank you for this article. I have been trying to do some research on getting my content out and name known in a few months so I can have secent prizes at the start of my daily pick em for NBA. That said, I think I may have to make my own 100 post challenge as this is day 4 or 5 for me and I've only written 3 articles thus far. I will have funds to promote articles within a few days and hopefully that helps. http://steemit.com/created/sports - unless its UFC I guess? Brilliant Mike!!! I am actually coming in just to blog somewhere that is worth my time and effort. Plus, there are great people to interact with. These are some of the best tips I've read today. Upvoting this post and re-Steeming for ya! Thanks with much gratitude! @mikeparker, why is all my stuff being greyed out? I'm really super new and I'm putting alot of thought and hard work into my posts. Seems like a waste of time, but I'm sure it's just something I don't understand yet??? Wow, great story of your success and failed story..but it inspired me on how to get success by sharing your strategy..
For me being new to Steemit this article was really helpful. If you have any tips on how implement images on a mobile device that would be appreciated. Again all around great info and thanks for sharing! Thanks for your help,I`ll have this in my favs! Some good tips in there, thanks! I am working on expanding my readership and another thing worth mentioning is don't make your posts too long. Longer is good, I totally agree, and my 2000+ word posts have earned me the most so far (even though I don't have that many posts in all), but as some of my readers suggested, breaking them up into easier to digest chunks improves your chances of "hitting the lottery". Cheers! Good point on potentially breaking up long ones; never thought of that. I tend to write on the shorter side though. 800 to 1,300 words; maybe I'm auto-piloting at the sweet spot I hope! This is very helpful in trying to create my brand on here. Thanks again. Thanks for the tips, I will certainly take some notes. One thing I haven't done yet it to create an 'introduceyourself' post. I will get that done today. You better! Still waiting on it, are you being Lazy and Afraid? This is a great article, going to upvote and resteem. I have been trying to advance closer to the big leagues myself! This was very insightful! This post has received a 100% upvote from @melowd. Thank You for sharing. Wow, these are really good tips... planning on implementing them as I am interested in being "heard" in the community. Thanks very much for the valuable information. anytime; please come to me if you need any more advice! I dont think its only for minnows, I think regulars also can learn from this. I deffinently agree that timing is everything, I do however think that what pays the most on steemit is travel and crypto, its like the 2 biggest things ive seen here, I havent seen anything comming close to that. Thank you thank you; Maybe I'll be a dolphin soon; whatever that is. I'm sure people would say I have enough power to be called one already. Yeah that's one genre I haven't touched on; travel; though I love it, often don't want to get that personal. Good tips! And it does make a lot of sense c: Putting in just a little more effort can and does make a huge difference overall in how posts are presented. Keep it up man <3 followed and resteemed! and overall the theme is to be positive about your own content; be happy with what you write, I should have said that. Our passions in action deliver good quality! When I'm not that passionate about a post and just more greedy that's usually when I don't get the rewards. G'day. I like it. I'm going to try and follow all the tips in my next post and see what happens??? come back and let me know! It's also a long-term process and learning experience. Baby steps are more easier to eliminate to; but if you're not overwhelmed go for it! Do it ALL! G'day Mike. It's been a while but I finally found some time to do a new post. I tried to use some of your ideas (not all as I had to do it in a hurry). I would appreciate your honest opinion - be brutal if you must!! And thanks for the headline examples, using your own posts. Very nice guide, you didn't mention much about tags except the introduceyourself, got any other tips on that front; picking the right tags? There are not that many major categories that you want to pick for your first tag. start with the most important tag and then get more specific later to niche or less-related to your content tags. You inspire me as a new comer. I read all the content of your post. Thanks a lot. I hope I can be like you. I will follow you. How is it in Indonesia, have you been to USA? Indoneaia is a big country.with many lopulation. It is ranked 3 in the wolrd. Today is our independent day. Indonesia will be a good destination for.people or IT Company to invest their capital here. Wow..it will be amazing for my life if I can visit USA someday. Will try that 100 posts a month challenge! Tou are doing great, mate. yeah soon I'll do a sequel to this post because I have even learned a lot more in just a week. My followers are rapidly approaching 300 too. Hi, i think this is an exellent post, i'll apply this advices and wait for good results, thanks for sharing this info, you earned this upvote, best of luck in your way here. Thank you for this GREAT post! I will definitely try to keep these things in mind from here on out. These are surely very useful tips. But still not enough. At the end of the day marketing, interactions with other posts and luck plays the major role!! Congratulations on this post, your tips are very useful.. I did not know about platforms like Reddit and Steemit Chat. Awesome! I was looking for a good breakdown like this. Thanks for sharing! A link to your post was included in the Steem.center wiki page about Minnow. Thanks and good luck again! I am learning similar things as I go, it is so hard early on when you put in loads of effort and see next to no return and then when one of your articles blows up big it makes the effort worth it. Just like building any small business; the beginning is rough; until you establish yourself. Great tips! It can be so frustrating to spend time on a post and not reach anyone. You present here a nice list of things for anyone to check to see how they can connect their content with their audience in a better way. Encouraging post man. I've been back and forth with Steemit for a few weeks now trying different techniques and topics hoping something will work. Anyway, really appreciate the information you provided mate! Cheers! hope it picks up for you; what topics you like? Thanks my friend, I'm new here and will head your advice. I've had a couple of posts that have earned a few dollars already but I'm very much flying blind here. I've followed you to keep tabs and will look out for further posts. Just started and really in need of tips . much respect for people who give back. thanks ciao! Good tips that rely on good content and no "use this one weird trick" stuff. This should help when I start writing about building a sea container home. I'm slowly adding it to my feed as I learn how to write it as I want to read it. Thanks for all your good ideas and tips going forward ..appreciate! Any questions as well don't hesitate! Great advice! I was wondering if there was a "magic hour/s" to be posting, glad you mentioned that as well. I feel I have well, thought out posts and yet no audience. Some are photos but at least half have content. Very nice informative post! Followed, upvoted and resteemed. If you ever need reposts and resteems on your posts, let me know at http://steemit.com/@ebargains. Cheers! Hi - thanks so much ! I love the concept of Steemit , in the fact that its not "fast food" for the brain . Its actual information ...not just blips and cute cat photos ( which I love) . The other side of the issues is that its "not fast" and sometimes I feel overwhelmed with all the content . Also its a little scary for people whom are not writers or bloggers . I am neither , but will continue with this platform...because its the way of the future. I need to put these tips into action! Excellant tips and advice all worth trying thanks! Hey Mike! It is greatly helpful post for newbies like me. Thanks for sharing your experience. I am still gathering my words to come up with my first post. It is little difficult to start but as you said in this post to introduce yourself, I have got the idea to write my first post. The other useful thing to follow is that commenting also gives rewards. So when I am unable to post I will keep commenting :D Well it doesn't mean I will not post. I see. I already have some idea in my mind, like writing about some tutorials. New Steemian here! Thank you for all of the tips - I'll try to incorporate these into my approach. If you have a spare follow, it would obviously be much appreciated! Great article thank you for posting these steemit tips! one tip i find really great is the grab em in and hook them with your content! And always try to promote your posts ! hopefully someday i have success like yours on steemit! Thank you for posting this great guide! followed ! that first line is important; I forgot to think about that until now! Thank you for sharing your thoughts, tips, and tricks with us. This is an amazing site that we can all benefit from. We just have to get the ball rolling first! Your post was very helpful. Thank you! Good tips. Thank you for pointing me to this post. I will employ some of these at once. As you can see, I am elaborating more in my responses to possibly make them more interesting to readers. I have always read the post in it's entirety before making a post, this was more out of respect for the poster. If a person takes the time and effort to create a post, the message that they are trying to get across must be worthwhile. As soon as I finish this post I need to find out how to follow posters. So thanks again for your tips. Have a good day.